Oil on panel -30 x 23 cm. Oil on panel – 30 x 22 cm. Oil on panel – 25 x 20 cm. Road to the farm, September. Oil on panel – 20 x 25 cm. Oil on panel – 30 x 23 cm. Starlings on a telegraph wire, the fish van hurtles past, Shirley delivering her herring and mackerel door to door. Cider and ploughing matches, crows rise from the trees bickering. The cattle are coming into the byre tomorrow for winter, the tups are going to the ewes. Ian pares their hooves with a Stanley knife, shapes them, sprays them and tells them their day at the spa is over. Hawthorns tremble with scarlet berries, the leaves are all but fallen and the smell of cold sleepwalks the hill. A milky sky folds and flows, bell clang of metal gate in latch. It rings across the fields. Sky holes in the leaves. Under the trees. 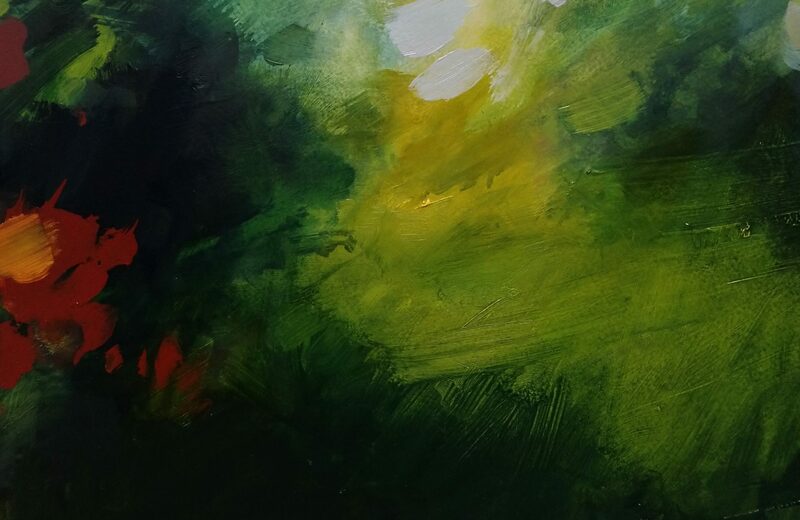 Gouache and acrylic on paper – 57 x 20 cm. Charcoal on paper – 33 x 23 cm. Warm winds from the south. Bright sun. Golden. A young man is ploughing the large field to the west. He climbs down from the cab and I introduce myself. He is shy and says nothing, climbs back in and carries on. I find out later his name is Stuart. He is sixteen. Bright pink seeds of wheat are scattered. I ask why they are pink and Ian tells me they are coated in a fungicide and pesticide. This is the last year they can be sown though as they contain neonicotinoids that harm bees and are to be banned. Ian recalls in his Dad’s time they sprayed DDT on the land. I watch two crows harry a kestrel. Radio one spills into the landscape from the pick up. We drive over to the giant turbine so I can take a look inside. Banks of Star Trek twinkling lights monitor the running of this machine. Ian points out the data on wind speed, kilowatts generated as we listen to it turning to catch the optimum wind. Outside the windmill blades cast dark shadows along the boundary wall of the field, blotting the sun momentarily. Back at the farmhouse Carole asks me to sign a postcard in petition of the closure of the GP’s out of ours service in North east Fife. This could and likely will have a profound impact on the elderly and most vulnerable. The day has brought questions arising from food production, energy consumption and health provision, all in the space of a morning. Back in the field and Raymond stops the tractor. He and Ian look at the large boulder brought up to the surface. I wonder why only now it has emerged. Perhaps the landscape continues to throw the occasional spanner in the works, thwarting our own ambitions.